Next post, I will deal with one of the main barriers to the implementation of blended learning: the fear that providing online content will lead to a drop in student lecture attendance or performance. However, the other side of the coin is that the academics who populate our universities simply do not want to have to learn new technologies to use in their teaching. In a bizarre state of affairs, those researchers who are at the forefront of the most technological fields consider themselves incapable of learning a basic piece of software. I’m going to try to make it clear how easy these tools can be to use, so that there are no such excuses! All of these examples will be based around the provision of online lecture recordings. How do I record my lectures? Option 1 – Video: You can record a lecture very simply by videoing yourself as you present. I know that some professors employ students to operate the video camera during their lectures to ensure that the quality is reasonable and that everything goes smoothly. However, one or more fixed cameras can also be used (see this example for the use of four cameras). Cost of cameras is coming down rapidly, so you can find a reasonable example for £60-100 with a memory card. However, you will struggle to get either the audio to be intelligible or the video to be legible with those cameras. More realistically, a £700 camera (such as this one) is necessary. Some tips on use can be found here. Pros: Easy to use, start the camera (or have someone else do it) and forget about it. Multiple cameras can give multiple angles to cut together to produce professional videos. Cons: The quality is the main problem with this approach. You will find that a camera situated too far from the screen will not have sufficient resolution to capture the text, and the audio will be very poor as well (you will be drowned out by sniffling students if you leave the camera at the back of the room). This means that you will need to record the audio separately (see below). You also need to be happy appearing on camera! Option 2 – Lecture capture software: This is the option that I have explored the most. It is easy to implement now, using software such as Camtasia Studio (£110ish with an educational license). Camtasia interfaces with Microsoft Powerpoint, so you don’t need to press any buttons at all. Once you load up Powerpoint and start your slideshow you will be asked whether you want to record the presentation. Select “yes” and the presentation will run as usual but the screens will all be captured and audio will be recorded. An additional bonus is that you can also overlay your narration straight onto the slides. There are two ways to do this: you can use a microphone connected to your computer which records the sound directly into the Camtasia file, or you can record the audio separately and edit the two together later. I like the Revolabs X-tag wireless microphone (£200) which you can wear on a lanyard around your neck while plugging a base station into your computer. The microphone is charged from the base when docked when not in use, so batteries aren’t needed. The sound quality is pretty good, and you don’t need to edit the audio later. Pros: High quality slide images and high quality narration allow you to convey all of the information in the presentation to the audience much more clearly than a video camera would allow. There are issues of cost, but universities often have some kind of software (Articulate and Adobe Connect are alternatives to Camtasia) and hardware (there are usually microphones lying around, even if they aren’t wireless) to help out. Cons: Your students won’t be able to see your pretty face, and some lecturers are much more communicative through body movements than others. This really depends on your approach to lecturing. Option 3 – Audio only: This is the most straight forward approach. 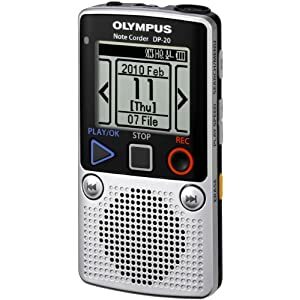 A decent voice recorder only costs £30 (I have used this one) and a microphone doesn’t cost much more than £5 for a cheap lapel mic (like this one). Attach the microphone to your lapel and stick the recorder in your pocket and you’re away. Alternatively, if you have a smartphone you can often record directly with that using the microphone/headphone combo that comes with the phone. I recently had a lot of success with my Samsung Galaxy SIII with the microphone looped over the top button of my shirt and recording using the built-in “voice recorder” app. Pros: Very simple and cheap with good sound quality if you use a microphone. Cons: The disconnect between your slides and the narration means that the students might have to operate the slideshow themselves if you refer to the material on the slides in any detail. How do I edit my lectures? Option 1 – Audio only: There are a large number of audio editors out there, making it very easy to do very complicated things for free. Audacity is a personal favourite and is more than enough to edit lecture recordings to trim the start and end, cut out any discussion periods or breaks, and adjust volume where necessary. Option 2 – Video and audio: Editing video is slightly more complicated. If you have lecture capture software such as Camtasia then the built-in editor is extremely useful. However, there are also a range of free alternatives. A good place to start is Windows Live Movie Maker, which is a surprisingly useful package bundled free with MS Windows. That program has the facility to overlay video and audio and to perform basic editing on both. For other free programs (that I haven’t tried) see this post. How do I share my lectures? Option 1 – Youtube: It might be a fairly frightening thought for introverted academics to post their own lectures on Youtube, but you should be aware that Youtube is a hugely useful and complex beast. By signing up and verifying your account, you can upload your videos (up to 5GB in size, and no length limit now) for free. The site offers statistics tracking, which is immensely useful for seeing whether or not your students are actually using the videos. You can also set the videos either as “public” (anybody on Youtube can search for and find those videos) or “unlisted” (people cannot find them unless they have the URL). For educational content that needs to have its audience restricted for copyright purposes, upload the file as “unlisted”. To share the file around you can either email the link to send people to the www.youtube.com site, or you can “embed” the video using html code on a site of your choice. Option 2 – Vimeo: Vimeo presents an alternative to Youtube that is slightly less public. The advantage of Vimeo is that you can password-protect specific videos to restrict access (a facility that isn’t available through Youtube). Unfortunately, the interface is a little bit clunkier and I have had trouble with students being able to view the videos despite having the password. If you have any approaches/technology that you use for lecture capture then leave a comment! Vimeo still is not as popular as it deserves to be, the resolution of the video is superb for a free platform.